"We had a list of about 100 names, Hello Moon was one of them. 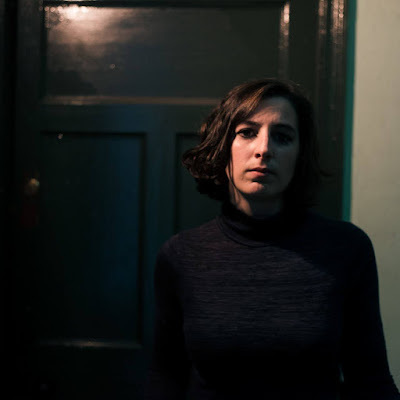 Second was Yep"
The importance of a well-written children's book is endless; The broadening of the imagination, the subtle shaping of a maturing morality and most importantly, the tasteful naming of indie-pop bands. 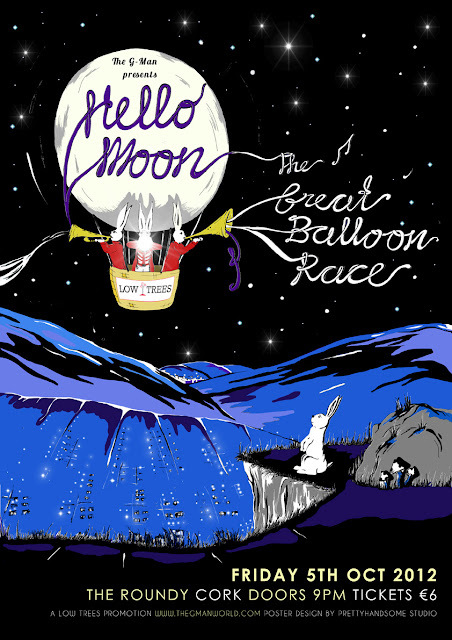 Taking cue from Margaret Wise Brown's 1947 novel, Dublin quartet Hello Moon introduced their "jingly, jangly" jaunts in indie bliss to the world in 2010. It wasn't long before they broke Hollywood. One of the group's Alans (one strums, this one drums) chats with The G-Man about all and sundry. The G-Man: Shooting back to the start, how did Hello Moon come to be? Alan (Hello Moon): Three of us played in bands together for years, not really doing much really just messing around. We had written a load of songs and demoed them but couldn't play them live. Amanda then joined us in January 2011 and we started writing to make an album. We had a list of about 100 names, Hello Moon was one of them. Second place was Yep. Hello Moon came from a children's book originally. There is a twinkly bright nature to Hello Moon's sound. Besides the name, is it possible children’s books have also influenced in other ways? Yeah maybe they have. There's probably some aesthetic sensibilities that are shared. Certainly there are children's stories such as The Little Prince that are very dear to us. Am I right in saying the music of Hello Moon recently appeared in a Hollywood blockbuster? That's right! We were lucky enough to have our music appear in a movie called Seeking a Friend for the End of the World, that starred Keira Knightly and Steve Carell. When we were looking for someone to mix our album, we approached a few engineers whose work we really admired. 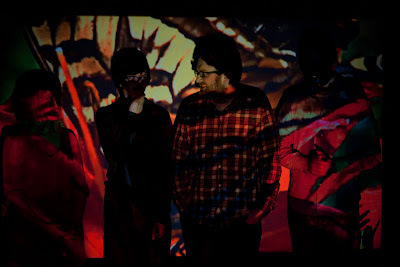 One of them was Adam Lasus (Clap Your Hands Say Yeah, Juliana Hatfield, Yo La Tengo). Adam runs a music licensing company with his wife Linda Cohen. They both liked our music and thought it could be fun and worthwhile working together. What was it like hearing 'New Day' boom across cinema speakers? It was really cool; A load of us went to the cinema together and cheered when our names came up in the credits. Has anything come out of featuring on the soundtrack of such a high profile movie? Not really, other than the possibility of more placements in film/TV. Hopefully we'll get some royalties too because we’re on a shoestring budget. Have Hello Moon caught the soundtrack bug now? If given a blank canvass, what type of movie would you like to soundtrack in future and how would you do it? I'd imagine that doing a soundtrack would take amazing levels of focus, discipline and planning - I’m not sure that’s our style. Although it could be an interesting exercise to try and write within the confines of a film plot/mood/whatever. We’re all fans of John Waters' stuff. Our music might suit one of his movies; It would be fun to camp/tacky it up too. Besides rubbing shoulders with the celebs, 2012 has been a busy year for Hello Moon. What else have you been up to? We started working on recording a 6/7 track EP in May this year. For various reasons it's taken ages to do but I think it’s nearly there. Apart from that we've played a rake of gigs (including our first show in mainland Europe at the Eurosonic festival) and contributed recordings to a few compilations released in aid of charity. How important are all these things for the Hello Moon CV? Do people pay more attention when they see soundtrack, Eurosonic etc.? I don't know to be honest. I'm sure it all helps but we still have a really low profile! (laughs) They've been great experiences and we've been lucky to have them. Looking forward to Hard Working Class Heroes 2012? Really looking forward to it, the line up is excellent. We’ll be playing on Saturday night at 11.40 in The Mercantile. We usually go as music fans every year anyway but we played at it last year too which meant even more running around. Sweaty. We played in the basement of what was then the Shebeen Chic. It was a tiny room and fairly crowded, cooled pathetically by an asthmatic air-con fan. Those factors combined with lights and amps meant temperatures were at least as hot as the surface of the sun. We were all drenched in sweat after the gig, even Eamon who's like the ice man and never sweats. What does it mean to be selected for such showcases? I don't think HWCH is as business focused as say Eurosonic where nearly everyone attending is connected to the music industry, and everyone is checking each other’s laminates while shaking hands and stuff. I don't know much about that but I do know HWCH is a good opportunity to get our music out there for a gig that's very well promoted and (hopefully) well attended by music fans. Did you catch many HWCH gigs in 2011? We tried to cram in as much as we could. Beyond Olden Acre kicked things off nicely. Biggles Flys Again, Ginnels, We Are Losers, and the Yeh Deadlies were definitely highlights. Caught Belfast band Morning Claws for the first time. Squarehead playing at a jam packed Button Factory was pretty memorable too. What three bands are you most looking forward to seeing at HWCH and why? HWCH is always a great opportunity for us Dubliners to catch bands from elsewhere that we wouldn't normally get to see. Besides that I ♥ The Monster Hero, Ginnels and The Spook Of The Thirteenth Lock will be definite must sees simply because they're three of my favourite bands around at the moment. In what ways do you feel you have progressed or evolved since the appearance in 2011? Nothing dramatic has happened but it's been good fun and that's the main thing. I don't know if our sound has changed much, we haven't reinvented the wheel or got a brass section in (even though I'd love that). I was listening to some really old demos we'd recorded ages ago and the newer stuff we've recorded is maybe a little bit more laid back. Certainly we've got better at recording and mixing and that sort of stuff. You'll hear the new recordings soon hopefully. Of course you play Cork that same weekend. What are your feelings ahead of the Cork gig? 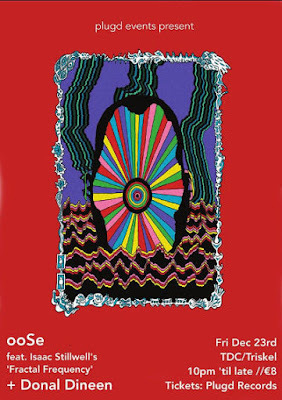 Really looking forward to it, we haven't played in Cork before (aside from Indiependence). For one reason or another, the times we were meant to play didn't go ahead, the great blizzards two years ago being one, so it'll be great to play and hopefully meet some new people. Little xs for eyes seemed to enjoy their time down here - also their first show in Cork - and got on great with The David Nelligan Thing , becoming fans of Dave and co’s music in the process. In such a small country, how important do you feel these kind of bonds are to an independent band trying to make their way in the music "industry"? It's very important to know people and form relationships and friendships. In the past indie bands have always worked together with others who had the same like minded DIY attitude, be that other bands, promoters, journalists, artists etc. to make their own "industry". It happens more than ever now, so even if just for practical reasons knowing a band who you can organise your own gigs with, put out records with, share instruments, mics, sofas etc. and collaborate with is as much necessity as it is brilliant fun. With what other existing bands do Hello Moon have such bonds? There's other bands on the Any Other City label like Two Whistles (formerly Hired Hands - the other Alan in our band plays bass for them occasionally) who have helped us out and vice versa as well as many other bands we love who we've borrowed from, shared, recorded and collaborated with in one way or another. Speaking of Little xs for eyes, Bennie [Reilly - singer and guitarist] was in Life After Modelling who released records on your current label. Tell us more about Any Other City and how you got together? Way back when myspace was still great (before it went all Myspace 2.0 and really difficult to use), I was browsing through some band pages and came across Jim Byrne's page - Jim founded Any Other City and plays drums in Villagers too). He had a blog up about a track-listing for songs he played on his show for Phantom FM. I read through the list and it was full of great stuff like The Four Tops, Orange Juice and Suicide. I thought he might like our stuff too and added him. He mailed us a few days later saying he really liked our music and asked if we wanted to meet up sometime. We did and he told us all about Any Other City and what he was trying to do and it went from there. Jim is a great guy, knows tonnes of people and works really hard to help us. He also gives the best pep talks ever! 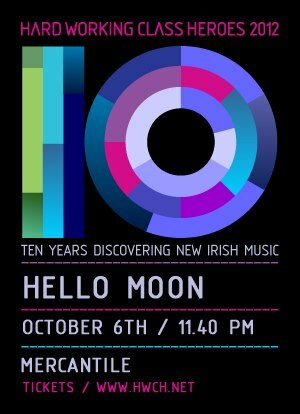 What Cork bands have caught Hello Moon’s ear over the years? Simple Kid, Elk, Waiting Room, Hooray for Humans. I've always had a fondness for The Frank and Walters and there's bands I've seen in Dublin who have people from Cork in them; Bridges of Madison County are an awesome live act but I wouldn't claim to know much about the scene so looking forward to experiencing it ourselves and really looking forward to hearing The Great Balloon Race live. Hunk who we saw recently in Whelan's are great too. Tell us one thing people probably do not know about Hello Moon? We all love puns; We always try to outdo each other. Rehearsal can get very cringe worthy at times, sometimes it gets so bad we've to go for a smoke break and pretend it never happened.